Being at the foot of Mont Blanc, Aiguille du Midi, and across the ridge from Chamonix, Grivel’s mountain heritage is unparalleled and built into their day-to-day lifestyle. Their proximity to the epicenter of mountaineering allows them to thoroughly test the gear to its limits. The Ghost ice axe is as light as possible to keep your exposure to the elements at a minimum. When it’s summoned into action, however, you’ll be able to rest easy and count on your tool. A curved aluminum shaft increases leverage during a self-arrest and increases precision when you need to swing it in steep terrain. The head is steel for maximum durability and power when stopping a fall or punching through thin snowpack during the spring. The head is toothless for increased comfort and “glove-friendliness” while using it as a cane. The shaft features a foam plug with a stopper behind it to make sure you axe doesn’t plug up with snow and get weighed down. A good weight-saving design, the aluminum adze is just big enough to dig steps but small enough not to get in the way. 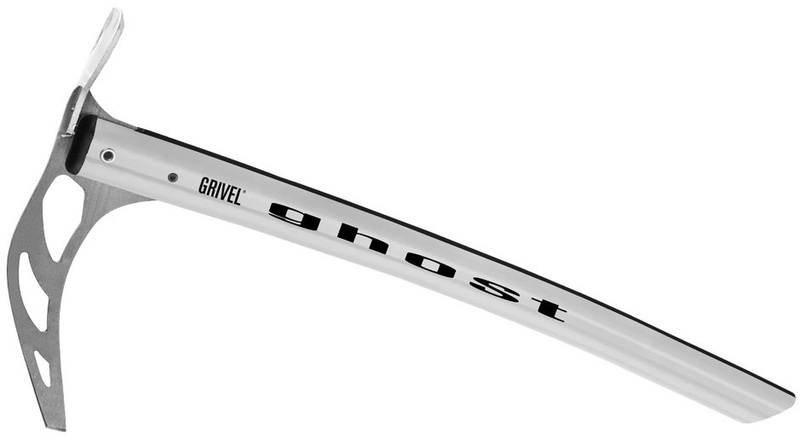 The Ghost is a well-thought out safety-focused solution in a sea of other lightweight axes. Curved aluminum shaft is shaped to save weight, increase stiffness, and maximized power during a self-arrest. Aluminum adze is small and out of the way until you need it. Steel head is hot-forged and as sturdy as they come.